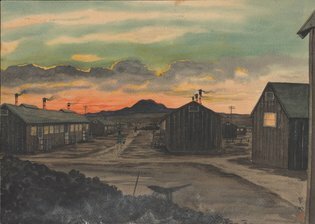 The Yale Sterling Library currently has on exhibit items from its collection of paintings, diaries, and other materials related to the internment of Japanese Americans during World War II. 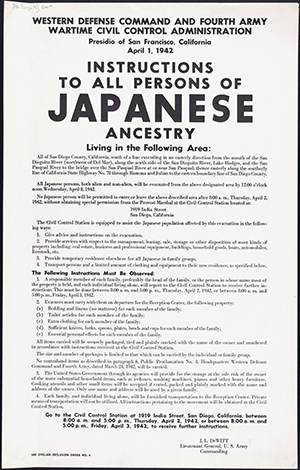 This free exhibit, “Out of the Desert: Resilience and Memory in Japanese American Internment,” is open through Feb. 26, on weekdays, at Yale University’s Sterling Memorial Library at 120 High Street in New Haven, CT. 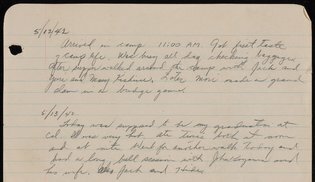 In her article about the exhibit, The New York Times reporter Patricia Leigh Brown focuses on on internee at a camp in Arkansas, Yonekazu Satoda, 94, whose diary from during his internment only recently came to light. As the article reports, Mr. Satoda records the trivial and profound, revealing the experiences of those interned — innocent civilians — as poignant and all too human. Interned for 3 years, Mr. Satoda was supposed to have graduated from Berkeley on only his second day of his confinement. Mr. Satoda became an “Mr. 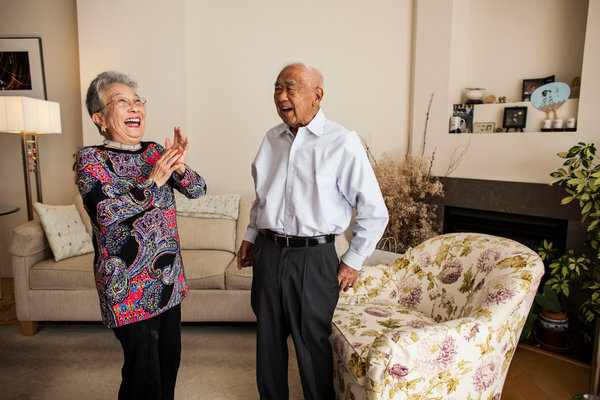 Satoda spent nearly two years as an intelligence officer in Japan, retiring as a major after 20 years of service in the United States Army Reserve.” Here he is with his wife, Daisy Satoda, who had been interned at Topaz. 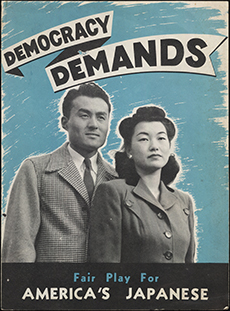 Mr. Satoda’s diary struck me immediately, not only because it is such a valuable historical resource. It also looks like my mother’s diary. 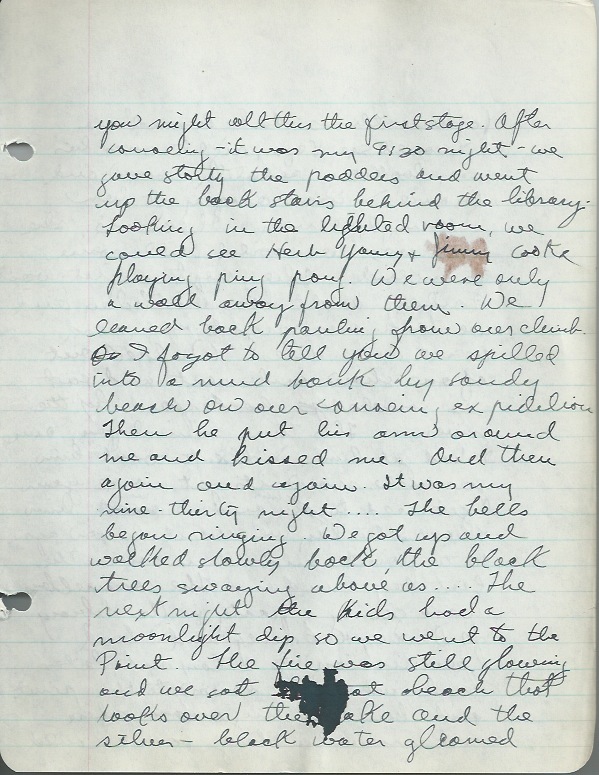 My mother’s diary likewise was in a ringed binder. I often wondered by she used a ringed binder. Was it because it was cheaper? Or she could add pages if she wanted to? On December 7, 1941, after Pearl Harbor was bombed, she reflected about the fate of the Japanese now that the U.S. was destined to join the war. She had been in the country with her girlfriend, Ruthie, and they had had no idea that the bombing had taken place. Then they get a lift into Chicago. One of the fellows drove us into the city and then Ruthie and I took the streetcar and saw a bright headline. US and Japan near war. And waited in a quiet tavern for another streetcar and got on and gasped to see in black placid letters as though it had been said before: “Japan Attacks U.S. We are at War. . . .” And saw two Japanese on the streetcar, gravely watching us. . . . I hope those calling for Syrian refugees to be interned learn from the history of our nation. I hope we would learn from that bigoted episode in our history as well. But it seems we often repeat our mistakes. I wish we would remember to be brave.